Description: Amtrak 281 arrives in Amsterdam on track 2. Originally it was supposed to be on track 1 but was forced to cross to track 2 as the L279 seen in the background on track 1 was having some problems with the lead locomotive. Description: The L279 procedes west having just recieved the clear singal from dispatch. Description: Rear helpers on coal train V634-17 heading for the mountains. 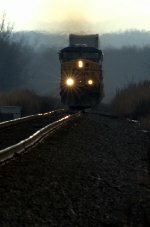 Description: CSX Q409 passes by Selma Station. Description: Now I see why YN3 is occasionally called 'Dark Future'.